Ending your day with a relaxing cup of warm tea is a great way to make drifting off into la-la land a little easier. When most people finish their tea, they toss the used teabag into the trash with little thought. After all, what could you possibly do with a used teabag? 01. The bags decompose: Did you know that most British tea bags are made from a relative of the banana? Manila hemp is made from the fiber of abaca leaf stalks. The bag itself will break down and the very little plastic they use to seal the tea bags virtually disappears within 6 months, according to the UK Tea & Infusions Association. 02. Tea adds nutrients to the soil: Tea leaves contain tannic acid and nutrients that are natural fertilizers for a garden. As the tea leaves decompose, they release nutrients into the soil, creating a healthier growing environment, according to The Gardening Cook. 03. Reduce garbage: Burying your teabags in the garden or tossing them in your compost pile helps eliminate excess waste. 04. Tea bags keep pests at bay: Used tea bags (and coffee grounds) will help keep bugs away from your plants. The odor deters the pests from chewing on your flowers and veggies. 05. The smell of tea works on cats too: Sprinkle coffee grounds or used tea grounds around your garden to keep fluffy from urinating on your favorite plants too. (You can do use this with indoor plants as well), Earth911 recommends. 06. Your teabags can grow a garden: Believe it or not, you can grow your own garden with used teabags, seeds, a plastic tray, water and a paper towel. You'll germinate your seeds with the tea bags and then plant them in the garden, according to the Kiwi Conservation Club. 07. 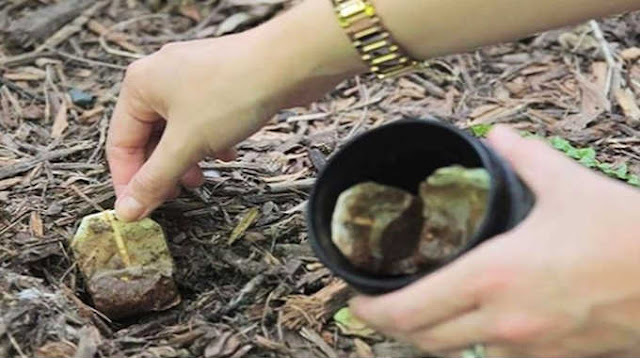 Tea increases the decomposition of other items: If you are using teabags in your soil or compost pile, the acid in the tea can speed up the decomposition process of other items in the compost bin, which means you can use the compost faster. 08. Worms eat the tea leaves: Worms can safely consume tea leaves. Once they digest the leaves they produce a more "nutrient-rich output," making your soil healthier for growing plants, according to VeggieGardener. 09. Teabags help with water retention: Bury your tea bags near the root of your plants, flowers, and veggies to help the plants retain more water and stay healthier. 10. Teabags help keep weeds at bay: When you bury your teabags in the garden, they can help impeded the growth of weeds (which means less work for you!). Have you ever buried teabags? If you know someone who loves to garden, make sure to share these tips with them on Facebook. This post was republished from diyeverywhere.com. You can find the original post here.